Drive, the most recent film by Nicolas Winding Refn (Bronson, Valhalla Rising) began its slow but steady climb towards cultural awareness a few months ago, with the release of what is, in my opinion, one of the best trailers of the year. Steady buzz has followed, including a very favorable showing at the Cannes Film Festival where Refn won Best Director, and heaps of critical praise. Word of mouth seems to be unstoppable at this point, with whispers of Oscar soon to follow, I'm sure, both for Ryan Gosling's performance and for Refn's directing. 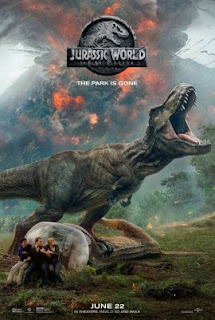 What I can't figure out entirely, is if this film will be able to hold up to its almost pre-destined reputation, or if further viewing will simply prove it to be something of a novelty. I'll further clarify my reaction after a brief recap. 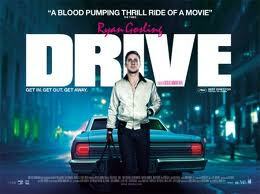 Drive focuses on the life of a nomadic young driver, in Los Angeles. By day, he puts his skills to use as a stunt man in the movie business and mechanic; by night, he's a get-away driver who lives by a strict code which allows him to wash his hands of being an accomplice, should the need arise. He is focused, intelligent, full of rage, and, of course, driven. Along the way, surprising even himself, he forms an attachment with his neighbor, Irene (Carey Mulligan) and her young son Benicio (newcomer, Kaden Leos). When Irene's husband, Standard (Oscar Isaac) is released from prison, the Driver's world is suddenly turned upside down. 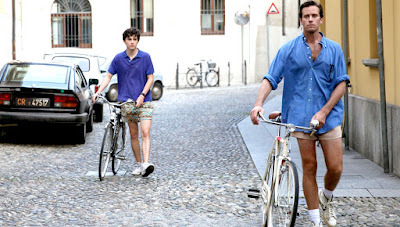 Standard is unable to escape an old debt, and feeling beholden to Irene and Benicio, the Driver agrees to help him pull one last job, expecting that, once it's accomplished, everyone will be able to go their own way, safely. This does not sit well for shady businessmen Bernie Rose (Albert Brooks) and his partner, Nino (Ron Pearlman) whose intertwined dealings inevitably leave the Driver surrounded on all sides. I thought I was fairly well prepared to understand the basic plot, considering that it's well hashed out in the trailer, as most films are these days. What's important to note about this movie is that the plot is secondary to character. We've all seen this story, over and over before. We, the generation that has already grown up with The Godfather, and who have anointed our own cinematic godfather in Martin Scorsese, know what happens when you attempt to outsmart "the family". But this is no generic heist movie, and the difference can be felt, not just seen. When I said before that I was surprised by the warm welcome for this film, that was for 2 major reasons. The first is that this film is shot and paced like a foreign movie. The pauses, the conveyance of full phrases of expression in a glance, the way the audience is treated in comparison to the characters. It's all very tricky and shadowed. The audience is almost always held at an arm's length, with just a few moments of breakthrough conveyed by Gosling's intense, nuanced stare. But be certain, we never understand this character; I doubt we're ever meant to. Many of the scenes are filled with a silence that goes on for, what many would say is, a beat too long. The suspense is palpable, like a character in and of itself, informing everyone involved in the experience, from the actors in the scene to the audience. It just, simply, doesn't feel anything like the usual fare. Part of me thinks that the reason the appreciation level has seemingly skyrocketed with this movie upon viewing is that, some people just don't know what else to do with it. It certainly LOOKS the way an award-winning movie should look, but it feels unlike anything I've seen recently, which is both good, and unsettling. It seems that when those movies come around, they tend to be viewed as "artistic" and therefore, nudged towards the favorable side of the scale. The second reason that I'm slightly surprised is that, the two best words I can think of when using to describe it is "visceral" and "unrelenting". It's a difficult movie to watch, in some ways, but in production terms, it's also strikingly beautiful. Mostly shot using the green, yellow, and red of a stoplight as its filters, everything feels just slightly heightened, as if there were an almost operatic tone to the whole story. The love the Driver feels for Irene and Benicio is instant and innocent, full of tragic longing. The innate abilities the Driver has to both put things together and tear them apart with his bare hands imply an almost super-human quality. The tale itself, tragic in the sense that, even in the beginning, we all know how this must end, reaching its climax in one brief, literally shining moment, before almost instantaneously dissolving. And the violence that cannot be contained once let loose. I'm a sturdy girl, raised on a cinematic diet of Quentin Tarantino and the previously mentioned Mr. Scorsese, not to mention one of the generation at which the bloodbath of Scream first premiered, but this is something different. This is something that feels deliberately raw and unsanitary. But judging from his work on Bronson, Refn doesn't like his audience to be a flaccid spectator, he wants them to be an engaged witness. There is a distinct difference. To the best of my abilities, the only way I can come up with to describe Drive to anyone is as a neon urban western that exists outside of time, with a dash of musical thrown in. Our main character is a nameless antihero/hero conundrum who has been put here to protect the innocents and then moves on. We're not certain where he comes from or what his background is, only that he mostly lets his hands do the talking, and that he's unafraid of getting them dirty. He's Clint Eastwood and James Dean rolled into one, alternately looking in desperate need of a hug from a neglectful father and like he'd just as soon strangle someone as talk to them. Instead of a cowboy hat and holster, he wears a scorpion jacket (that looks like it escaped from the Karate Kid wardrobe room in 1988) and leather driving gloves. He rarely speaks, but just when it feels as if the emotions threaten to overwhelm him, a catchy synth-backed tune comes on, explaining just what's going on in his mind. At other times, when the Driver is preoccupied with his own thoughts, sometimes there's a low droning buzz that drowns out the other characters' dialogue. It's both convenient and unconventional, and precisely keys in to the audience's participation. Gosling has to be, and is, the standout here. This is his world and everyone else is just a brief player on the stage. He's frightening and pitiable, often in the same moment, secluding himself away as if even he's afraid of his own power. Mulligan doesn't have a lot to do here, besides shine. She's often shot in slow motion with a dreamlike quality about her, like a Ghetto Virgin Mary. The other bit players, including Brooks and Bryan Cranston's Shannon, the Driver's boss, are all memorable, but it must be said that I don't think Ron Pearlman will ever be able to NOT be Ron Pearlman in any role. Nino is over-the-top, spouting racial slurs like "thank yous" and there was a slight feeling of "ok, I get it, he's the big baddie". But like I said, this isn't a movie about the other people, or even about the points that move the story forward. This is simply about the Driver, and in that, it's successful. It's one of the most unique character studies I've ever seen. It might prove to be a polarizing film, and even now, after seeing it and thinking about it over and over, I can't decide if I actually liked it, or if I just couldn't look away. Maybe the latter means that it was more successful in its mission. Overall: 3.75 out of 5. This could be one worth revisiting in a little while, after I've had time to digest it further. I think everyone who's curious should certainly go see it. Perhaps you'll think it's absolutely brilliant right off the bat, just, speaking of digestion, make sure if you're squeamish you go on an empty stomach.